I was hoping to do a post for Thanksgiving last week and, well......last week slipped right by. But, I will tell you what I am grateful for. Today I am grateful for: my family, my friends, knitting, yoga, Obama, democracy that works, tribal bellydance, education, reading for pleasure, music that grips me, freedom, love, honesty, beauty in art, the warmth of the sun, bright stars at night, peaceful moments and good memories. I've been knitting a bit. Last year at this time, I wasn't really knitting so much because I was engrossed in school. This year is a little different. Oh, I'm still in school, but I'm knitting a lot just to prove that I can to spite my work schedule and homework load. Because I'm a friggin' rebel like that. So there. This is the Shalom Cardigan. Sorry for the lazy Ravelry link. It took about sixteen hours to knit and I used Lopi yarn. It's a keeper. I even wore it to work and got some compliments. It is the Wavy Feathers Wimple. The picture is so awful, but my house is quite dark and it was nighttime. Sorry. Hopefully I'll be able to get a real picture in the daylight and post it properly. I must tell you that the pattern was addictive. 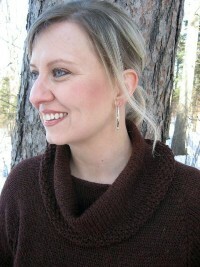 I used Frog Tree Alpaca sport weight. This next pic is for my friend Shannon (the sadly-blogless Shannon, who thinks she's not cool enough to have a blog. Whatever). Anyway, she's not cool enough to have a blog, but she is cool enough to be in Jamaica right now. Historically, On certain Friday's, after work, Shannon and I get together and drinknit. We used to just knit, then we started to have a drink and that didn't mix well with the knitting, so now we just drink, but call it drinknitting, as a cover, you know? Wink, wink. (this is my sad-knitting-homework-surlyfuriousbeer-endtable). It is dusty. If you are in MN, you can probably get this beer and I highly recommend it. Yes, I am knitting (and blogging) whilst slightly under the influence. This is Francis Revisited. The yarn is Cascade 220 heather, in some sort of brown with red and black speckles. I call it goth-chocolate. Only because I'm currently reading the Stephenie Meyer's teen vampire saga that is listed in my sidebar. I never thought I would, but I am. And I love it, so far. State of Emergency or Where the hell's the coffee?? Today, at the office, we ran out of coffee. I also had severe computer issues. I wanted to take my computer out to the parking lot and drive back and forth over it a few times. 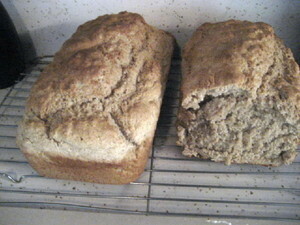 I've tried that homemade bread recipe (like Tastefully Simple Bread) a couple of times now and it is fabulous!!! I will no longer buy the boxed bread from them. Mix ingredients until dry ingredients are wet with the beverage. Do NOT overmix. Mixture should be globby. Preheat oven to 350 degrees and bake for 55 minutes in lightly greased bread pans. If you've thought this through, you'll realize that you have 1 cup of self rising flour left over. Here's how I solved that dilemma. I just doubled the self rising flour recipie, made the bread (2 loaves) with 8 cups of flour total (instead of 6) and had bigger loaves. It worked just fine. If you double the recipie you might want to add a dash more baking powder and bake it for an hour. Also, you will want to use 2 and 1/2 beverages so the dry ingredients get wet. No wasted flour this way (But a half a beer -or other beverage are leftover- and I can deal with that. I also mixed whole wheat flour with the white flour. You can pretty much do anything you want with this. You can throw in cinnamon, ginger, brown sugar instead of white or whatever. I added a bit of molasses with this batch. Crazy Good!!! Going to take a little run after this settles for awhile. Oh, and I'll finish the laundry. Such is the life of a domestic goddess. If you try the recipe, let me know how you like it! !